My CNCCookbook blog is experiencing it’s second outage so far this month. That’s a cause for visitor unhappiness and potentially lost business. I use Page.ly, because I believe in SaaS services. CNCCookbook is bootstrapped, and I try not to spend any of my time at all doing something that I can easily have done for me by a SaaS provider, like hosting a WordPress blog. 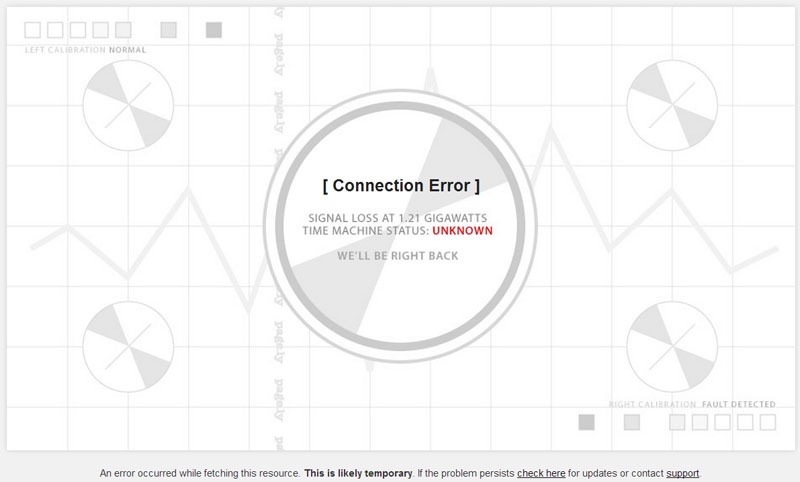 Page.ly has been pretty good in most respects, though far from perfect in terms of outages. Frankly, there have been too many outages and having two in one month is starting to be a bit much. Their story is that their hosting provider, FireHost, has created both of these problems. It’s even affected the Page.ly blog, as it did the last outage too. Ironically, I wouldn’t be posting this blog except that Page.ly’s blog went to the same screen I’m showing here when I attempted to comment that maybe it was time they thought about Firehost alternatives. Whatever’s going on at Firehost, and however much it saves Page.ly to use Firehost instead of some more reliable service, it’s not worth it guys. It’s making you look bad, and through extension, that makes my business using your service look bad. The good news is if it continues, it is very straightforward to migrate to Page.ly’s competitors. I also have experience with WPEngine from a prior company, and found them to be more performant and a nicer service, but quite a bit more expensive. Perhaps some of that expense is going to a better hoster for their service. At CNCCookbook, we use Amazon for our own services and I can’t remember the last time we had an outage. Maybe once have we had one, and it involved the simple expedient of rebooting our EC2 instance. In the end, if I do move the CNCCookbook blog, I will be checking who the new provider uses as their hoster. If it’s FireHost, there’s not much point in moving. Some service should start aggregating up time data on the hosting services. It would be good to know who your SaaS provider uses–unless they’re huge they probably don’t have their own servers–and how reliable that provider has been over time. While it may not seem like it, it will be in every SaaS company’s best interests to cooperate with such data collection simply because it shines a light on the hosting providers that will require them to rise to the next level of reliability. As it stands, they’re a step removed and much harder to track. Sorry Page.ly and Firehost–no links for you. Not happy today. This entry was posted on February 25, 2013 at 4:21 pm	and is filed under business, cloud. You can follow any responses to this entry through the RSS 2.0 feed. You can leave a response, or trackback from your own site. We host our corporate site on pagely and are similarly displeased today. Unfortunately it was similar repeated experiences with wpengine that led us to them in the first place. Apparently hosting wordpress is hard. Or something. Grr. It is not fire host that is going down just so that is very clear. In many of these cases it is simply an issue that has been created by pastries system that leaves the people using Pagely am able to resolve or get to their site but the people using fire host are up 3M uses them Dyn a lot of fortune 500s and if you think that they’re going to sit around and tolerate town time you’re nuts. It’s issues from what I could understand in the way Pagely is built that when he certain thing happens at firehouse data center in Dallas the only do center there on aside from being cashed in London now that it causes problems for people using Pagely and Pagely alone. I have to say I love FireHost & WP engine. That’s where I host my site and if you want switched data center’s you can. There is never going to be 100% uptime find any host. However you can get pretty close. I like every manage WordPress as I’ve mentioned up there. Some are more expensive than others and somehow different features than others. I would take a look at the overall uptime using Google figure out what the uptime of All the managed host and I believe you’ll find one that you’ll like a lot. From what I understand and what I have seen there are companies I have listed that have very high uptime. With the managed WordPress press Extras everyone wants.